Tata Motors has achieved a new feat in its last mile public transport portfolio by reaching a remarkable sales mark of 3 Lakh Tata Magic, its most popular public transport vehicle. This is a significant achievement for the Company given that unlike a cargo vehicle, apart from vehicle registration, a passenger transport vehicle also needs permit, an approval issued by a state or regional transport authorities for the use of a passenger transport vehicle. Only on receiving these permits can an operator ply these vehicles on the roads. With the Tata Magic, Tata Motors has been successful in breaking this highly complex structure of the last mile passenger transport vehicle industry with over 85% market share, in this segment. The Tata Magic enjoys unmatched brand equity in the segment and will contribute towards the Smart Cities programme by providing an all-weather proof, stylish, four-wheeler, safe and comfortable passenger carrier, which is better on emission and provides superior operating economics. Over the years, Tata Magic has earned appreciations from various government stakeholders – district authorities / transport authorities and also Ministry of Urban Development have been endorsing it as an ideal vehicle to replace old three wheelers and uplift the face of last mile public transport in urban & rural markets in India. Today, with the achievement of 3,00,000 sales mark of the Tata Magic, we yet again, confidently testify the value and trust we offer to our customers. The Magic’s success is a testimony to our engineering excellence and strong customer orientation. With a market share of over 85%, Tata Magic has revolutionized the last mile passenger transport segment. We are proud and humbled by the immense support and trust provided by our customers which has helped us reach this milestone. With the largest and strong growing network in place, a continuous slew of upgrades, new launches and specific marketing interventions, we continue to be the dominant player and make huge strides in the Small Commercial Vehicle Industry. Being the leader in the commercial vehicles industry in India, Tata Motors gains in-depth knowledge on consumer sentiments and requirements. The Company recognized a latent customer need to create a completely new market segment to pioneer the concept of small passenger carriers. Developed on the remarkably successful ACE platform, Tata Magic was introduced in June 2007 as India’s first small commercial four-wheeler in last mile public transport. 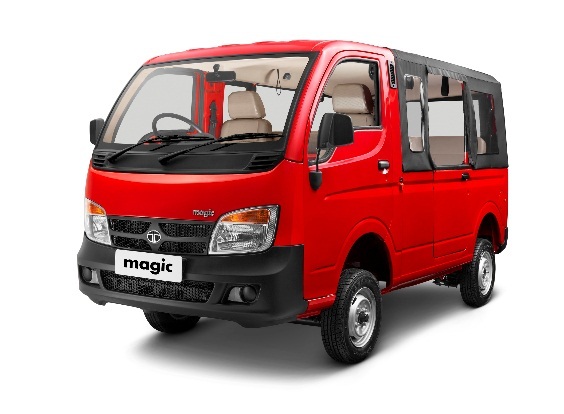 The Tata Magic was designed to offer a comfortable, safe, four-wheeler public transportation mode to the urban and rural areas in a segment which was dominated by three-wheel passenger carriers. Like the ACE brand, the Magic family too has helped uplift many lives and has been a strong contributor to the growth of many entrepreneurs in India. As the Tata Magic family’s renown spread, Tata Motors went on to make deep inroads across the country. At present, about 184 dealerships, with 1,600 showrooms, sell the Magic variants. The Tata Magic is used as both intercity as well as intra-city vehicle. While the Tata Magic sells across all states in India, the key markets are Rajasthan, Uttar Pradesh, Orissa, West Bengal, Bihar, Maharashtra, Madhya Pradesh, Chhattisgarh, Karnataka and Andhra Pradesh. In states like Rajasthan, Gujarat, West Bengal, Magic has been allowed to run in intra-city routes with stage carriage permits. The Tata Magic has replaced many auto-rickshaws in Gujarat, Rajasthan, Assam, West Bengal, Madhya Pradesh and so on. The Tata Magic is also sold through Tata Motors’ rural Marketing initiative for commercial vehicles, known as NEEV, a detailed rural program with exclusive focus on villages of India. It incorporates village executives called Tata Gram Mitras and Tata Kisan Mitras who promote Tata Magic along with other products in villages including schools across the country. The Magic family has been constantly evolving, strategically identifying and filling gaps in the market ahead of its time. The platform has thus far produced about 4 offerings, based on engine type and fuel. The Magic family today comprises of the Magic Diesel (BS3 & BS4), Magic CNG (BS4), Magic Iris Diesel (BS3 & BS4) and Magic Iris CNG (BS4) and will continue to add more variants in the family in future. In addition, the warranty has been increased and the Tata Magic now comes with an unmatched warranty of 2 years / 72000km (whichever is earlier). The Tata Magic is manufactured at the Pantnagar plant, which began its commercial production in August 2007. The plant is spread over 953 acres, of which 337 acres is occupied by the vendor park and is the Company’s fourth manufacturing plant after Jamshedpur (commercial vehicles), Pune (commercial vehicles and passenger vehicles) and Lucknow (commercial vehicles). With State-of-the-art facilities, the Pantnagar plant includes weld shops, paint shops, engine and gear box shops and assembly lines. Tata Motors has invested over Rs.1000 crores in the Pantnagar plant and the vendors for the vehicle have made additional investments to set up their plants in the vendor park adjoining the plant. It is Tata Motors’ first plant with an integrated vendor park, to keep inventories low and to ensure JIT (Just in Time) supplies. There are 73 vendors accounting for almost 75% items supply to Pantnagar plant. As the country today celebrates “Make in India”, Tata Motors is proud of how Tata Magic has successfully traversed global boundaries. Today, the Tata Magic is exported across 20 countries across SAARC nations and African countries such as Angola, Bangladesh, Bhutan, Congo, Djibouti, Ethiopia, Ghana, Kenya, Mozambique, Myanmar, Nepal, Nigeria, Philippines, Senegal, South Africa, Sri Lanka, Sudan, Tanzania, Vietnam and Zambia.